Details at the end of this post on how to enter to win an e-book copy of Skeletons In the Attic, and a link to purchase it from Amazon. Calamity ‘Callie’ Barnstable has quite the dilemma. After her father fell off a thirty-story construction site due to a faulty safety harness in what has been described as “an unfortunate occupational accident,” she has inherited his entire estate including a house of which she has no memory. The dilemma is the codicil which explains Callie must live in the house for one year. Money has been set aside for the needed renovations and her living expenses, and after the conclusion of one year, she can do with the property what she wants: rent, sell or remain. The shocking part of the dilemma is the reason her father made this stipulation: find out who murdered her mother. Murdered? Callie was led to believe she abandoned her and her father. However, her father’s interest in what had happened to his wife had been reignited by the last renter, psychic extraordinaire Misty Rivers, stating the house was haunted. Haunted by a former resident who loved lilacs. Lilacs, the only thing that would grow on the property–lilacs originally planted by her mother, Abigail. Her father surmised his wife must have been murdered and had intended to investigate himself, but his untimely death stopped that. It is now up to Calamity to uncover the truth. She heads off to her new living residence and her new goal in life…find out what happened, if anything, to her mother. Callie finds several clues, meets interesting people and discovers lots of proverbial ‘skeletons,’ but real conclusions about her mother’s disappearance do not come easily. She uncovers family photos and an envelope with a curious set of tarot cards and piece of jewelry, opens her father’s safety deposit box with its own revelation. Continuing his investigation, she finds newspaper clippings and photographs posing new questions and pointing to suspicious characters. What does it all mean? She is told that friends could become enemies and enemies, friends. Who does she trust? What can she believe? I am thrilled to have joined in on this reading adventure penned by Judy Penz Sheluk. She provided wonderful characters who act and react in real ways, wrote well the conversations and descriptions to keep me turning the page, and had me guessing about who, what, and why. This mystery by Judy Penz Sheluk earns 5/5 Trunks of Hidden Memories! 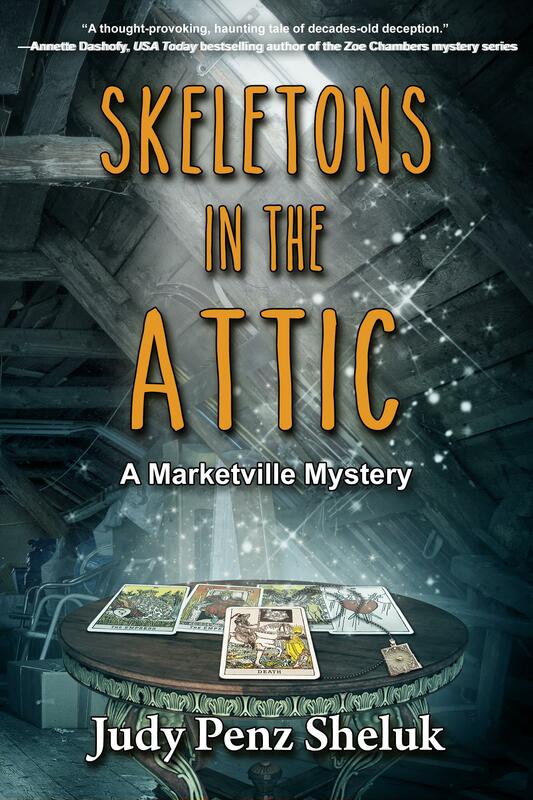 To enter to win an e-book copy of Skeletons In the Attic, simply email KRL at krlcontests@gmail[dot]com by replacing the [dot] with a period, and with the subject line “skeletons,” or comment on this article. A winner will be chosen September 3, 2016. If entering via email please include your mailing address, and if via comment please include your email address. Thanks for such a great review, Kathleen, and thanks to Lori for posting this on KRL! Good luck to all on the giveaway. Thanks for the giveaway. Sounds like a great story. I love tarot cards and all the background it sounds like the book has…please enter me. It was fascinating and a catalyst for me to explore more. You will enjoy the rest of the story, too. There are tarot cards in the book, Marilyn. The five cards depicted on the cover are especially meaningful. Wooooooo -sounds spooky and interesting! The book is also an amateur detective drama, as Callie explores all the clues on her mother’s disappearance. But, there’s a hint of romance, friendship, and quirky people. You’ll love it. Great review Kathleen! This book sounds really good, and I would love to have the chance to read it! This is on my TBR list! Can’t wait to read it! thank you for adding it to your TBR list! I love the cover. Really makes me want to read this. Thanks Becky. The cover was designed by Ryan Thomas Doan. He did an amazing job. Thanks Celia and good luck! 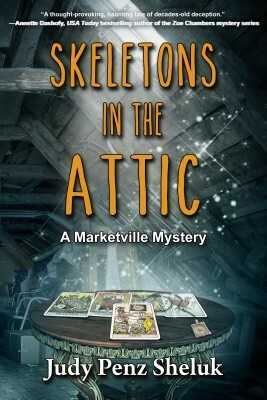 Love the title of this book and really want to read “Skeletons in the Attic”. Really like the storyline and what will be found in the inherited house. Thanks Dianne. The title is culled directly from an event in the book! Sounds like an exciting new series. Thanks for the giveaway. Thanks Linda for reading about it! Thank you for the chance and the reviews. This story sounds really good especially with cooler temps hopefully on the way! Thankyou for this great review! I have to read this book. This is my first time seeing it. So glad I did. Thankyou for the opportunity! Skeletons sounds like my kind of book! I just happened upon your book via my FB feed. Yay!! !